An opportunity that arises once every ten years is an opportunity not to be missed. 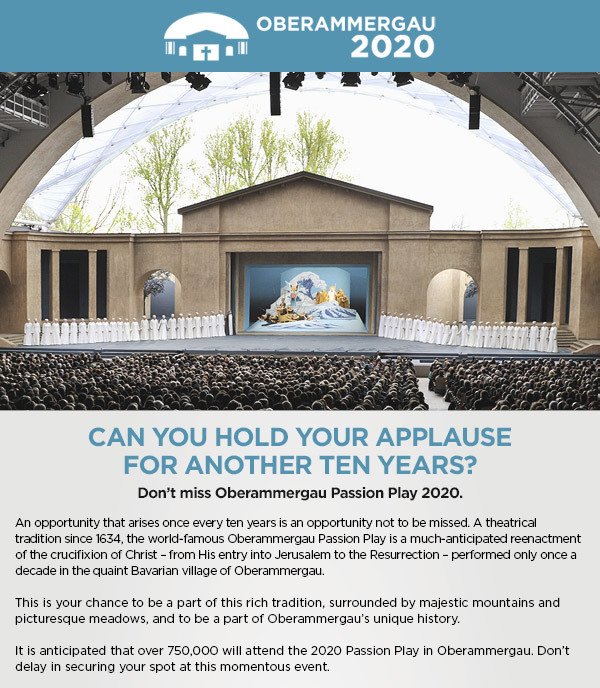 A theatrical tradition since 1634, the world-famous Oberammergau Passion Play is a much-anticipated reenactment of the crucifixion of Christ – from His entry into Jerusalem to the Resurrection – performed only once a decade in the quaint Bavarian village of Oberammergau. * The "from/to" pricing is per person, in Canadian dollars, based on double occupancy and includes taxes. Flights and travel insurance are additional. Dates, prices and terms & conditions will be advised at time of reservation and are subject to change. For more itinerary information, please visit: VisitOberammergau.ca.